Punching shear elements DE are V-shaped bent grids or ladder-like reinforcing strips which are manufactured industrially by means of electric resistance welding in a manner similar to reinforcing wire mesh. The wires of the chords and vertical bars comply with group B500A of ÖNORM B 4707. Punching shear elements DE are manufactured in various heights and side lengths and can be used generally as punching shear reinforcement in all reinforced concrete plane load-bearing structures. They are arranged radially in a rotationally symmetrical fashion. The height of the punching shear elements is determined according to the thickness of the slabs minus the concrete covers and the height of the lower and upper reinforcement layers. 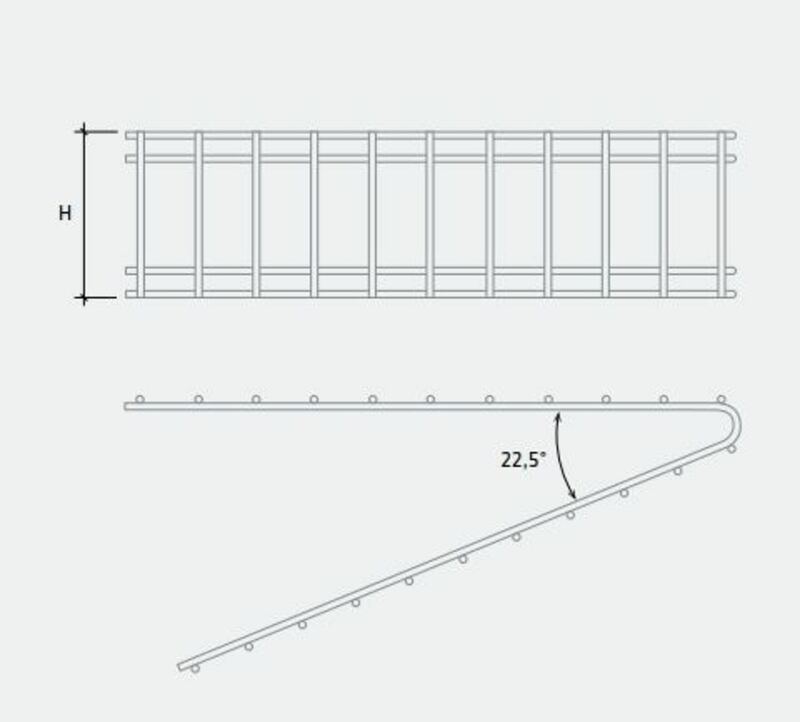 Punching shear elements DE are especially suited for use as punching shear reinforcement in the support area of point-based supported slabs (flat slabs). The range of types covers heights of from 100 mm to 320 mm. 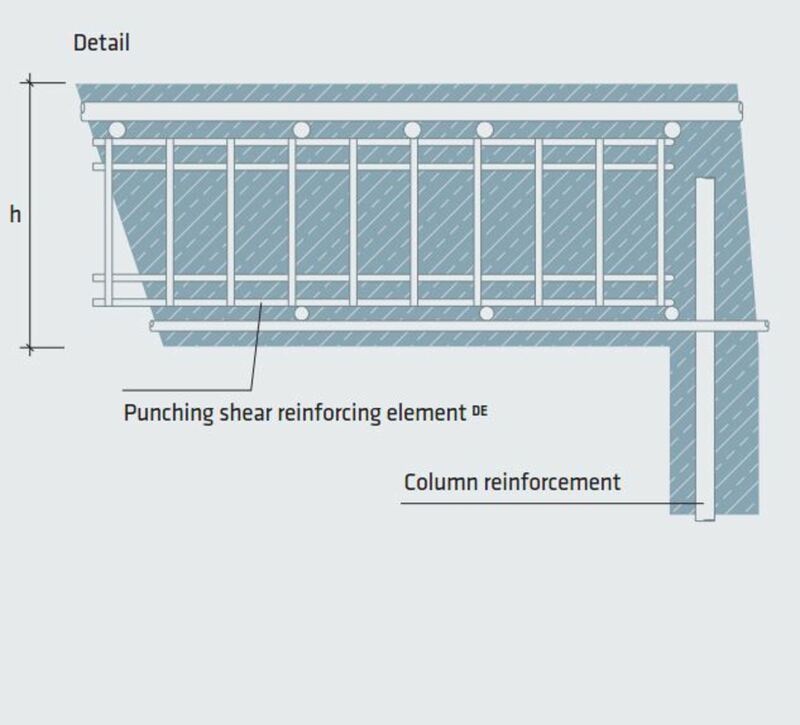 The area at punching-shear risk in point-based supported slabs is reinforced by the vertical bars of the punching shear element using a very close-meshed design. This enables the large shear forces in the induction zone to be absorbed by a great number of thin bars, thereby enlarging the punching shear area. 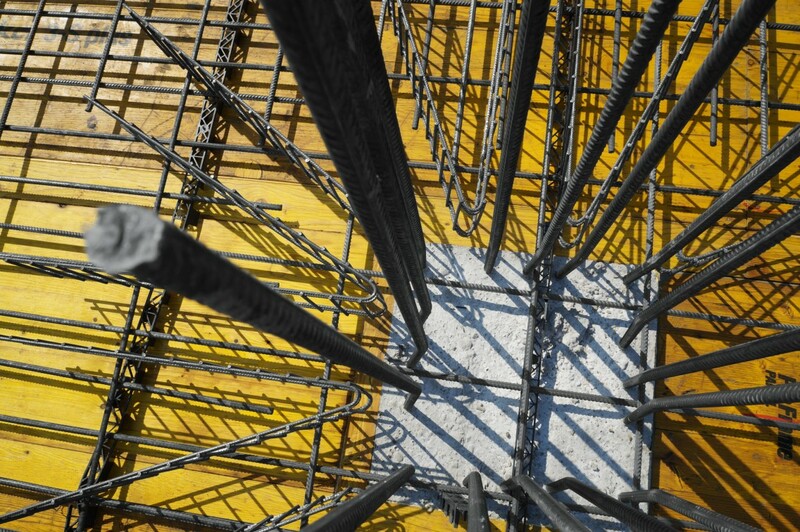 The anchoring of the vertical bars in the tension or compression zone of the reinforced concrete slab is accomplished by using two welding joints each on the double chords. 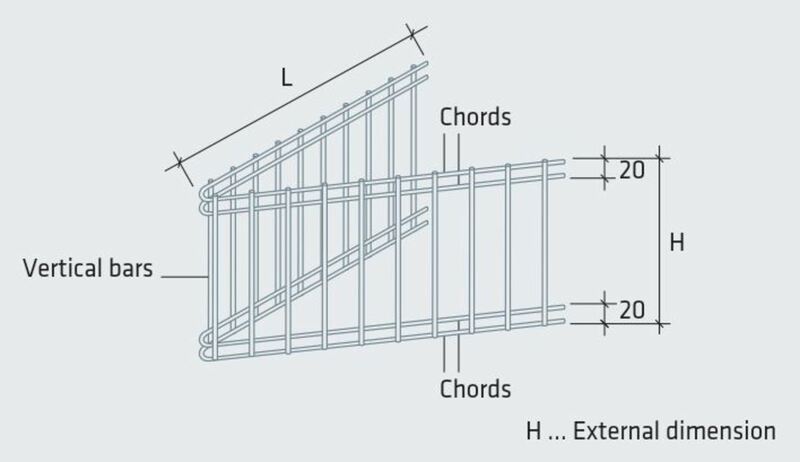 The application of the force to the bending tensile reinforcement above the support is also accomplished via the double chords. 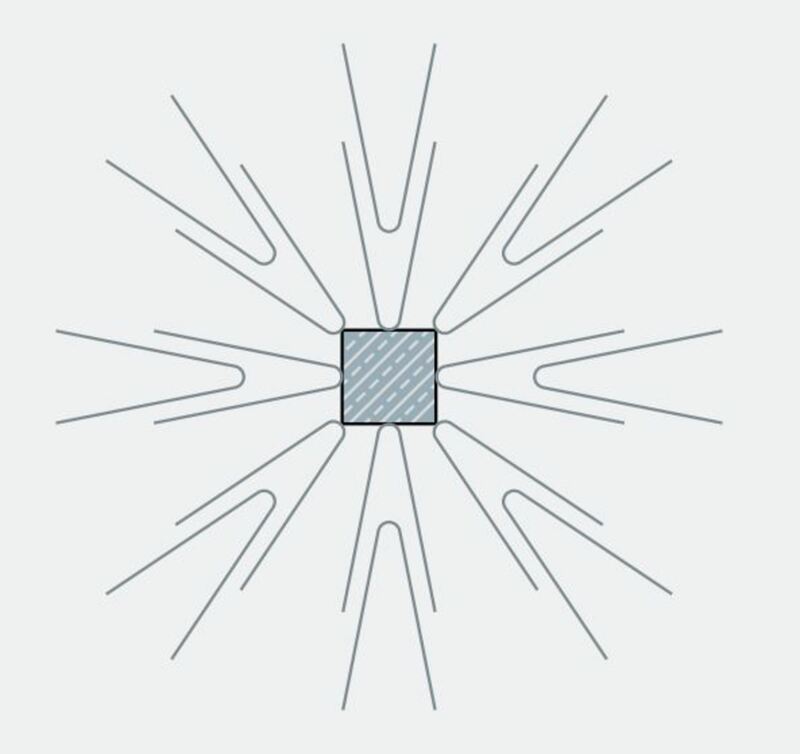 The vertex of the V-shaped punching shear elements DE in the support area should be aligned along the supporting edge and it is therefore not necessary for it to extend into the column cross-section. 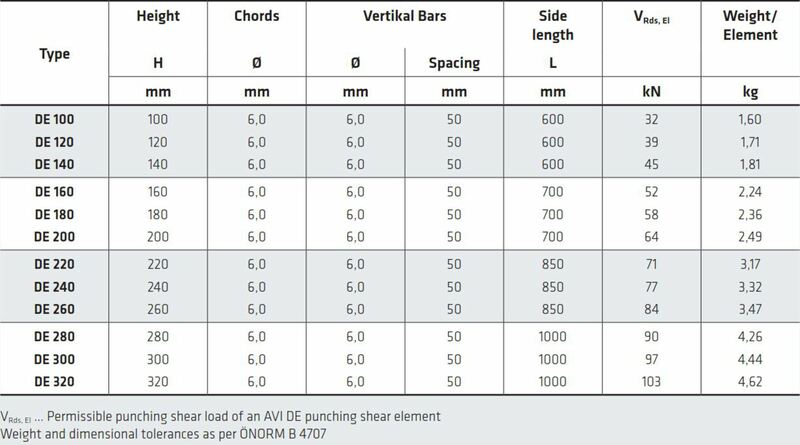 AVI punching shear elements are placed between the upper and lower layers of flexural reinforcement and thus also serve as spacers at the same time. Generally, eight elements each with an opening angle of 22.5° are placed in the column head area in a rotationally symmetrical arrangement. The type of punching shear element is selected in dependence on the slab thickness. 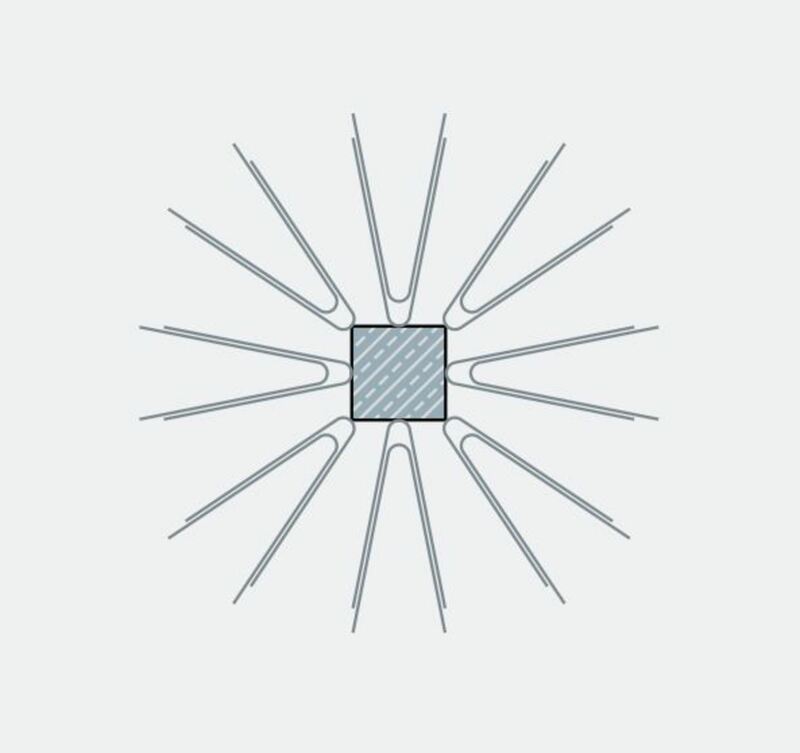 This therefore defines the outside diameter of the star-shaped shearing load area, or the side length of the individual elements for a single row of elements.